Friday night was the next 5k on my schedule. It had been 3 wks since my last 5k, which translates to, 3 additional wks of quality training. More importantly, 3 wks closer to summer in South MS/LA. Not ideal for racing, but fun anyway (if you like near death experiences). The official results haven't been posted, which is a good thing because this is a big, non-chip timed race. (last year around 1500 runners) It takes around 8 seconds before I arrived at the start line, so we will happily go with my Garmin time. 23:50 - 7:38 avg. 7:54 too slow (by 19 seconds - near death). Shortly after the race, I look at my splits - the last mile irks me. I go into the Greek Festival area for just a few minutes. I'm quickly uncomfortable with the crowds, and the lines are WAY too long so I bail. I still have to drive another hour to South LA. When I get back to the car, around 8:20, the temp is 84 degrees. So at race time, I suspect the temp. was 85-86 degrees? ?, I feel better about my time. So in comparing my Garmin to Garmin time from my last 5k. I ran 7 seconds faster and the temp was 5-6 degrees warmer this week. Knowing the temp. has a big affect, I will call it success! So I max.ed out my heart, and gave it ALL I HAD Friday night. 7:38 reality with 85 ish temp. yeah, I'm OK with that! 2 more weeks of my 8 wk, 5k plan. I am hoping to be a little more adjusted to the heat. This race will add a new challenge. The last 2 races have been evening races, 6pm, and 7PM. The final race will be at 8:00 am. The temp. will be cooler, but the humidity will be much higher in the morning. The next 2 weeks will be filled with 8:00 am runs. Most recently, I've been doing more, later in the day runs, to get ready for heat. Now a little more race specific training (8:00 am) for the last 2 wks. I've also decided to cut my mileage a little these last 2 wks. I had planned to go back up to 50 miles this wk, but have decided, I will hang out around 35 miles instead. Just feeling like that may be a good adjustment at this point. It's Memorial Day - Chad had to work, but we will celebrate with crawfish tonight. I'm so thankful for all of our Veterans, our current military, and military families. The sacrifices are appreciated! the smell of gardenia everywhere. I feel my body becoming stronger each day. This brings a smile to my face. I hit 45 and 50 miles per week. What's in the numbers that makes me smile? I'm nearing another training peak. 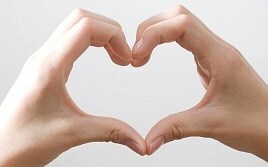 It's a high, that I love and savor. but each time is special. Tonight I tried a Joy Baur recipe. In a separate bowl, microwave a half cup mixed berries for about 1 minute--then stir warm berries (w/ liquid) into ricotta cream. Back in Feb. 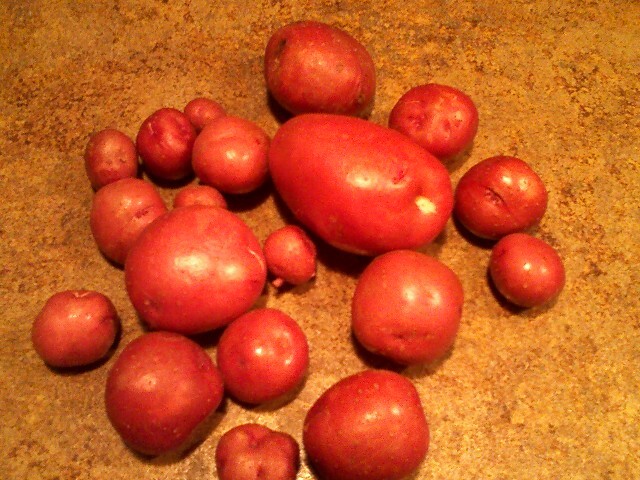 I decided to plant a few "seed potatoes." This was my first time to give this a try. Not having much confidence in my gardening abilities, and because I already have WAY TOO MUCH yard work, I only planted about 8-10 pieces of the seed potatoes. Today, I decided to do a little digging to see what I would find. Not too bad for a novice. no chemicals, no pesticides - I like that! Wish I had more motivation to garden. There's something really nice about knowing where your food comes from. It's also nice to know.....I did that! Wk of May 2nd - step back wk in mileage - 22 miles running, etc. *Thurs. - 5 with a 3 mile tempo run 8:45 avg for the 5 miles - the 3 mile tempo was at 7:53 avg. Chad ran with me for the 400 workout on Sat., and on Sunday. On Sunday, I needed 4 miles for 45 miles for the week. sunday conversation with Chad, after the 4 mile run to finish 45 miles for the week. Me: "that's 45, and that makes me HAPPY!" Chad: "that's all it takes?" Me: "pretty much!" lol ! Wed. - 5 miles easy monitoring heart rate. 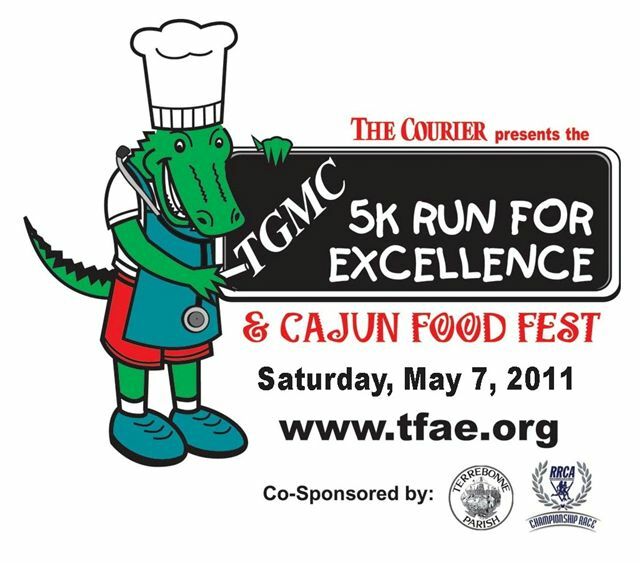 Sat evening, the hubby and I headed to Houma, LA to run a 5k @ 6:00pm. While I spent most of my day, catching up on blogs, twitter, TV, reading a book, resting up for my evening 5k, my honey was at work. He worked, rushed home, took a shower and sat down on the couch. About the time he was about to doze off, I announce it's time to leave. He LOVES ME! He was able to get a quick nap on the way. As we set out, YOU KNOW that I QUICKLY notice the temp. 78 degrees! We have a quick conversation, my typical , hot and humid chatter, but the bright side ..... at least it's cloudy. So as the hubby fades off to dream land, 15 minutes into the drive, the sun pops out BRIGHT, and the clouds quickly fade away. By the time we arrive in Houma, we gain another 2 degrees. It's around 80 degrees at race time, but the humidity is not as bad as it typically is in South LA. Always a BRIGHT SIDE! As noted, I've been trying to do better with "REALITY." In the last 5k, I averaged 7:39 pace. So today, typically, I would have rationalized that I have 3 additional weeks of 5k training behind me, so for this race, I should try for 7:30-7:35 avg pace, totally ignoring the heat of the day. 15 - 17 degrees is huge for me, especially when I haven't been racing at that temp. Today, I decided to try to go out around 7:40-7:45, adjusting for the heat, before the heat adjusted for me. The last race my hubby met me around mile 1, or maybe 1.5, and ran the rest of the way with me. That's the first time he's joined me for that much of the race. Today, he surprised me when he decided to register for the race, and run the 5k with me. Wow! I don't think he has EVER run a race "for fun". Fun for him, I would be "racing." Around mile 1, we were entertained by a guy running off of the course, grabbing a beer, chugging it, and then returning to the race. We laugh about it, and I tell my hubby, "see what you've been missing?" (he's always been in the lead pack, all out racing) We're at 7:42 pace. I'm actually feeling strong. I can feel the training paying off. Today, I feel stronger through mile one at 80 degrees, than I felt 3 wks ago at 65 degrees (7:38 first mile 3 weeks ago). Progress, not by time, but by feel. The positive - I'm happy that mile 1 was close to the same mile 1 from 3 wks ago, when the temp was better. During the last mile, hubby points out "pigtail" girl up ahead. Hubby is really competitive, Ginny is not! (except with HER personal times) I REALLY wish I had some of that competitive drive to BEAT people. I know it would help my 5k times. I know HE really wants me to get her, I really want to run as fast as I can, so, I try. He points out that she's probably, only, 20 years younger than I am. I'm thinking, EXACTLY! I'm not out here to compete with 20 year olds. I did "get her." Turns out, she's a 40 year old pigtail lady. Which reminds me, maybe I will wear pigtails. They make you look really young, from the back, for sure. Ha! Obviously, the last mile hurt. I thought we maintained the pace, and maybe even picked it up, but upon review, the last mile was 7:52. So I ended the May 7th 5k at 23:57. Last night, I was disappointed with mile 3, but today is a new day, and this is what I think about the race today. May 7th 23:57 5K- 7:42, 7:39, 7:52, :43 Garmin 3.10 80 degrees, mild wind in the last mile. *I'm 1 week, post half marathon. *I had some good "signs" during this race that I think will show themselves as I'm able to acclimate to the heat and humidity. * I can be in denial, or I can continue to acknowledge, the 3 lbs. gained after the Snickers marathon, in March. It DEFINITELY has an impact on my racing. So, I can either continue to race with the extra lbs., or I can choose to do something about it. (broken record - sorry) It is a CHOICE! *not only did I get the pigtail lady, we "got" the beer guy too. I have 3 weeks of training until my next 5k. I'm sure I will have ample opportunities to train for the heat. (May is typically WARM in South MS and LA) I'm excited as this personal challenge moves forward. As the heat increases, the challenge for 5k improvement increases, but I'm enjoying the challenge. Today, I'm pretty sure, my hubby ran his PW (personal worst). He did that for me! Chad's sister and brother-in-law were at the race and we were able to chat, and have dinner with them after the race. It was nice to see them, and have family at the race. Andy came in 2nd in his age group, and ran a fast time, 21:33. This is his 2nd race after many years of zero running. Happy he is back at it! I enjoyed reading these, as it circled the blogosphere a while back. I finally took the time.... Here ya go! B ed size: King- a must for a good night. D ogs: one dog, love her, but I’m more of a cat girl. E ssential start to your day: coffee & breakfast – gotta have it! U nderwear: it’s a secret! This will be a step-back week in mileage. I've had 3 weeks at 40 miles (39, 40, 40), and the half marathon, so it's a good time for a bit of a break in mileage. No long run this wk. Started the week out running easy - recovery days after the half on Sat. Tues. - 3 miles easy with 6 X 10 second "pick ups"
Thurs. - 7 miles on the bike. 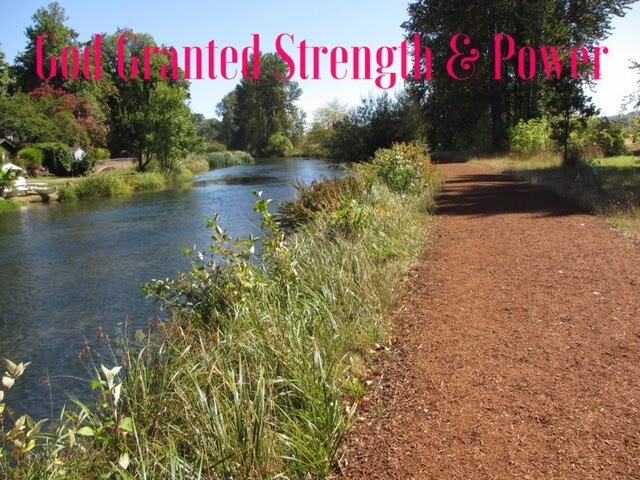 missed my 2nd weight workout this wk, but hubby and I trimmed the tree limbs and weeds along the wood line of our property, so "trust me" when I say, I definitely had a workout. Looking forward to a nice relaxing weekend. A great place for a race! Friday afternoon, I drove a little over 2 hours to Ridgeland, MS. I picked up my packet and headed to P.F. Changs for dinner. 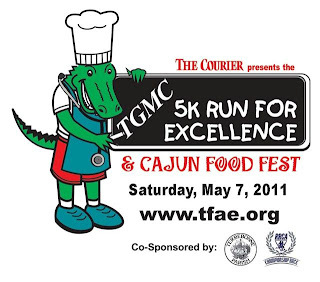 I had my gift certificate that Rock N Roll New Orleans sent after the race in Feb. Sweet! Sat. morning I was up at 4:00 for the 6:00 am start. I stayed nearby, and with this being a smaller race, traffic isn't a problem. The temp was around 55 degrees at the start, which is much cooler than I was expecting. We have had several nights where the low has been around 70 degrees, so I was happy and excited about the 55 degree start. My plan was to go out the first 2 miles slow, around 8:25 pace, and then pick up the pace from there. I warmed up a mile before the race. As I made it to the start line, just before the race, I was not able to get to the 8:00 to 9:00 min. pace area, so I started knowing I would do some weaving. Again, this is a smaller race, so it wouldn't take long to get with runners of my same pace. the 1st mile was not a problem because of the crowd, I struggled to get on pace. It's REALLY not a good thing when you plan to start out slow, and then you can't START the race, mile one, at your slow pace. At this point in the race, I can still do a little math, and I quickly calculate at the end of the first 2 miles, I'm back on the plan. 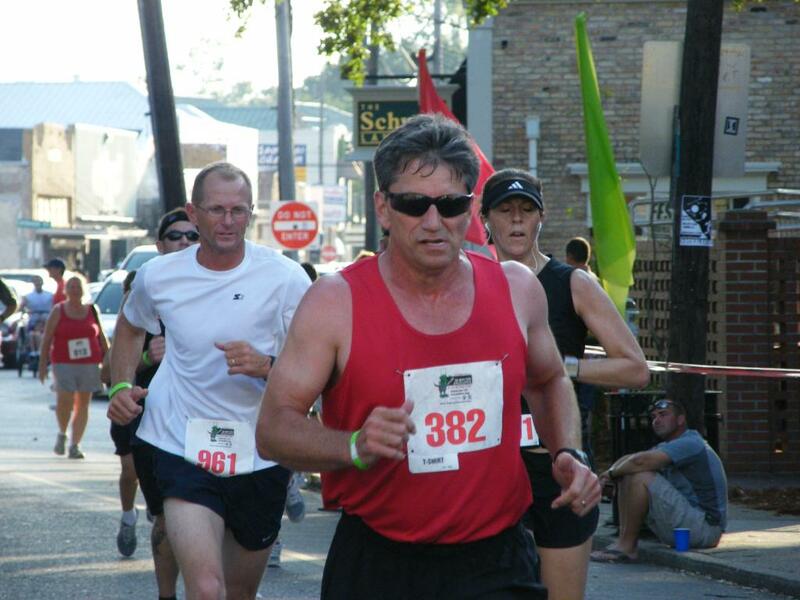 I ran the Mardi Gras half in New Orleans in Feb. For a couple of years now, I have been "drinking on the run." I grab my cup, "crimp" it, and drink it on the run. I had some issues in Feb., later in the race, with recovering after my water intake. It's NOT easy to drink on the run, and it REALLY takes the "AIR" out of me in those later miles. I realized on Sat. that it's the faster pace of the half marathon that creates the breathing issues during the later hydration areas. (not an issue in the marathon) Seriously, after I finish drinking, it's taking me about a minute, or more, to be able to get my breathing calmed, and then try to get back up to pace. On Sat., two of the stops were just before hills. I was drinking while running up hill, and then trying to keep my pace, and recover. This has me wondering if I may do better to walk the last few stops. Really don't want to do that because it's hard to get back on pace after walking, and the walking takes even more time. Hmmm???? It's been thoroughly documented my lack of "hill racing" skills. But then to add hills and trying to drink, race, and maintain my pace, all at one time - eek. ....let's just say, I haven't mastered that yet. finally was happy to be done with the hills on the course and then was hit in the face with a strong head wind for the last few miles. Fun stuff! I gave it what I had today, and that makes it a great race day. With each passing mile, I tried to get back on pace, but as AM noticed, my recent training has lacked tempo runs. I most definitely need tempos to run well and "finish" distance races. I am happy with the results on Sat. because of the number of years that I have been training, and my age (which I hate to mention), I must be 100% focused on the distance to do close to my best. I'm continuing to "see this", "realize this", "learn this", but I'm a slow learner so it takes me a while. I have to learn things over and over, and over again before I truly "get it." It's just "funny" how I continue to think I can pull magic out of my hat without being 100% focused on the particular race. A few other observations from the day. This race was changed from June to April because of the heat in Mississippi. 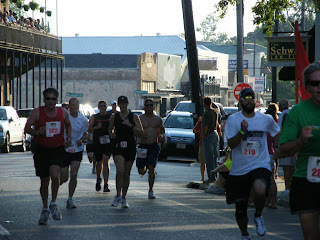 I was disappointed at first because the half marathon, in June, in MS, was a unique endurance challenge. A challenge that I enjoyed. However, with the cooler temps, and the new green of spring, this is a beautiful course. The cooler temps allowed me to see more because I wasn't in a "heat coma." Ha! 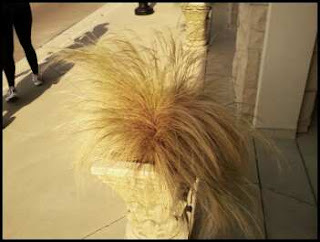 I took this pic because I love these grassy plants that blow in the wind. Seeing it blow in the wind is calming and therapeutic. If you are a shopper, you should add this as a destination race. 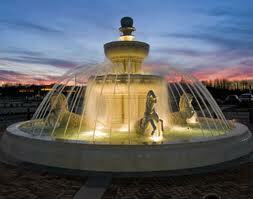 The Renaissance at Colony Park is an amazing upscale shopping area. 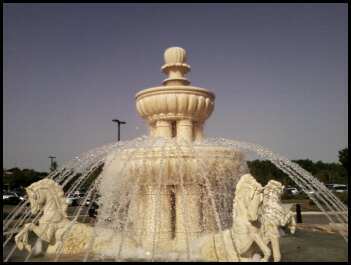 I'm not a shopper, definitely not an upscale shopper, but the area is GREAT. Wed. - am 5.5 miles - 1.5 mile w/u, 12 X 200 @ :51 second avg. (6:51 pace) with 31 second avg. recovery, then I went to yoga and we did hip openers - perfect! weights, and core work, and Wed. evening was the 4.5 miles easy, with Scott Jurek and Chris McDougall and friends. Totals - 40 miles running, 1 yoga class, 2 days of weights and core work,etc. and 6 miles of walking. and now, 100% total focus on the 5k, a test of the mind - total focus!